I started working as a police dispatcher for the Forest Acres (S.C.) Police Department in 1978 while I was still in high school. I actually went to school in the day and worked the evening shift on the radio at night (for about a week – then I graduated). That began a law enforcement career that has now spanned over 32 years! I worked narcotics as a Special Deputy and went on the road as an officer, and later road supervisor, for the Irmo (S.C.) Police Department. In 1983, I was appointed Police Chief when I was only 23 (don’t get too excited – Irmo was a teeny, tiny department – and we drove Volkswagen Rabbits for police cars)! In the mid 1980’s, I worked on staff at the Institute of Police Technology and Management (I.P.T.M.) in Jacksonville, FL. Among other things, I was responsible for all micro-computer, tactical, training officer, and special investigations courses. In 1987, I went to work as a Police Chief for the second time in Summerville, South Carolina where I served for about 7-1/2 years. We did some interesting things in the Community-Policing arena and even got some national notoriety for some of our intiatives. After that, I had this crazy idea to run for Sheriff in Dorchester County. And to everyone’s surprise (including mine) I won! Three terms later, I had my time in (not to mention being fed up with cut-throat politics) and decided to retire so I could pursue other opportunities. I served for a year in Afghanistan as a Professional Mentor to the Afghan National Police. 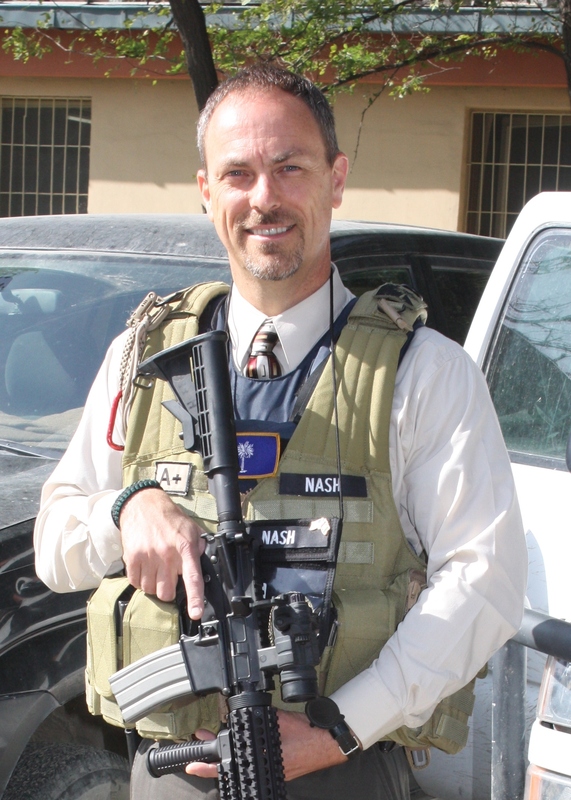 Now, I’m back in Afghanistan as a Police Advisor for the US Department of State working out of the Embassy in Kabul. Over the years, I have provided consulting services and leadership training to law enforcement agencies all over the U.S. and internationally. In 1998, I founded the Police Dynamics Institute to provide character-based leadership training and technical services to law enforcement agencies around the world. 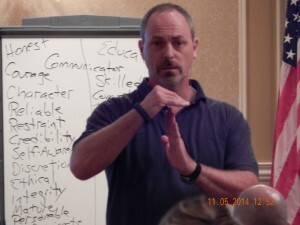 To date, I have personally trained over 10,000 law enforcement officials and government leaders, nationally and internationally, in the character-based training program I developed called Police Dynamics. I have traveled to Romania twice at the invitation of their National Police to train their Crime Prevention Unit and National Academy Instructors. In 2009, I was invited to Sierra Leone, Africa to train their National Police and Military leaders. In addition, I have trained Russian Police Commanders at the Moscow Police Command College (conducted in the U.S.) and over 30 international police delegations here in the states. As much as it surprises me to learn, leaders from around the world are looking to the principles of Police Dynamics for answers to the difficult problems faced by law enforcement. Agencies throughout the U.S. and overseas have adopted the program and are reporting great success in fighting crime and improving officer performance. My education includes an A.S. degree in Criminal Justice and a B.S. degree in Education, Training and Development from Southern Illinois University. I finished up my Master’s Degree in Criminal Justice Administration while I was in Afghanistan (still waiting on the diploma to arrive in the mail…!). Concern over the decline in American values led me to found the Palmetto Declaration Society (on July 4, 2001) and serve as its first President. The Society (although inactive at the moment) seeks to promote good government and honorable citizenship based on the vision of America’s founders (maybe I need to resurrect it in blog format when I get a chance…). My permanent home is in Summerville, South Carolina where I live with my wife (bless her heart for putting up with me and all my adventures, as well as my mis-adventures) and my three college-age children (now you know why I’m in Afghanistan trying to make some money). I had the privilege of being a founding elder of two different churches, Cornerstone Community Church in Jacksonville and Oakbrook Community Church in Summerville. I was real active with the Promise Keepers movement at one time serving as an Ambassador Trainer and Security Volunteer. I try to remain active in various church activities and was recently asked to stand in for the Chaplain at Camp Gibson while he was on leave. Hi, I just got the Twitter request from you. I use another email account so I followed you there. It’s nice to see what you are doing. I also write on virtue and character. Sounds like you’ve been doing some interesting stuff as well. Have you set up a blog site for some of your writings. I would love to offer a link to it. Your books sound very interesting. People often seek answers to questions and look for information from others, not realizing that they have the answers themselves. Their “true” self holds the answer … unlocking that answer in ways that allow them to stay true to themselves is what allows them to move forward. Ray, I reviewed your videos and listen to the lessons, especially on Ethics and Character. As a Law Enforcement officer for 33 years in two states I can categorically say that you are on the right path of training for police officers and Command Staff anywhere. I am honored to be a colleague of yours here in Afghanistan. I will follow your lessons and expect that whoever uses this blog will find the right answers required of our profession. I wish you God’s speed. Finally…. I have made it! I`m on your site! Congrats as it is fantastic! Keep up the good work and hope to meet again someplace in this great small world :))! It’s great to hear from you all the way from Romania! I still remember the time you and the other Romanian Police officials visited us in Dorchester County. We had a great time sharing principles of character-based leadership and discussing the similarities and differences of policing in our respective nations. Thanks for checking out the blog and please come back to visit. I will try to keep it updated, informative, and inspirational. BTW: How is Senator Tirle? I think about him from time to time. Is he still representing Romania in the European Union…? Believe it or not, I now find myself working for the European Union! I am currently assigned to the International Police Coordination Board Secretariat, which is supported by EUPOL, as their Rule of Law Coordinator. I run into Romanian police mentors quite frequently and try to use my limited Romanian language skills when I can. Have you heard from Senator Tirle? I would love to connect with him again and any of the members of the Romanian delegation that visited Dorchester County. I have had the pleasure of hearing Ray speak on several occasions. I have the highest regard for Ray as an instructor, professional, and leader. He is a unique blend of natural ability, directness, common sense, and sincerity. But most importantly, Ray’s strong desire to build moral and ethical character traits in all those he instructs, makes him a truly talented and gifted teacher. I have had the pleasure of working for Sheriff Ray Nash and the numerous opportunities to listen to him speak. I can honestly say from then til now I have taken more time to digest and really absorb the character training. Sheriff Nash is a great leader and breaks down the training to a natural, common sense understanding. I truly thank him for building me up to where I am in my career. Thanks, stay safe over there. I have just started viewing your blog and find it very interesting and informative. As a retired police chief from NC, I can say in today’s law enforcement, I have seen a decline in ethics with our law enforcement community, which parallels with a huge decline of morality in our society as a whole. Your work focuses on leadership and ethics putting GOD back in the driving seat. May you be a blessing to our law enforcement tasked with keeping us safe back home. I hope to make your service Sunday; I was locked down on another base last Sunday due a VBED threat. See you Sunday. I am from Singapore and happened to come across your resources while searching on information regarding Importance of Character in (Christian) Ministries. I am very inspired by your vision ” to promote good government and honorable citizenship based on the vision of America’s founders”, especially in these last days of decline morality. May God bless you richly wherever you are as you shine for Him.